Many pieces of media attempt to evoke certain feelings or emotions in the person consuming it. Maybe its as simple as getting said person to empathize with its characters. Perhaps getting you to feel the same romantic emotions that a protagonist has for a love interest. Or even just trying to awaken a sense of fear or dread within you. A common one in the gaming sphere is evoking the feeling of power, making you believe that you have the strength to singlehandedly take down the Nazi regime or something. What about sadness, though? We do have the catch-all genre of “drama,” in which some works will occasionally try to coax out a few tears from the audience. However, this emotion isn’t usually focused on as much in games. After all, video games are supposed to be fun, right? How is sadness fun? If your definition of fun involves a river of tears, though, the Japanese genre of “utsuge” might be for you! Translating roughly to “crying game,” the goal of games that fall under this category is to make the player cry. How successful they are at accomplishing this goal varies from game to game, though. Actually being able to evoke such a strong emotion can take some serious writing skills, which isn’t always something games are known for. 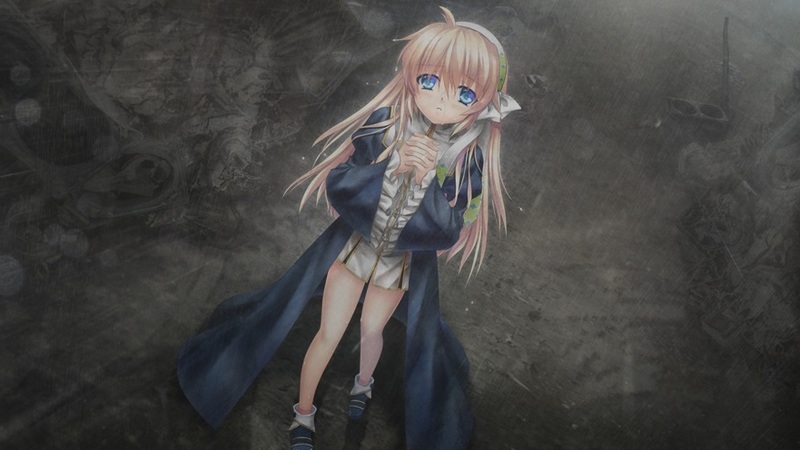 The Japanese visual novel studio Key is quite well-known for creating these utsuge games, and I must be one of those people that finds joy in weeping, as their catalog includes some of my all-time favorite visual novels. Long shying away from releasing their titles outside of Japan, Key has recently begun exporting its work to English-speaking markets. 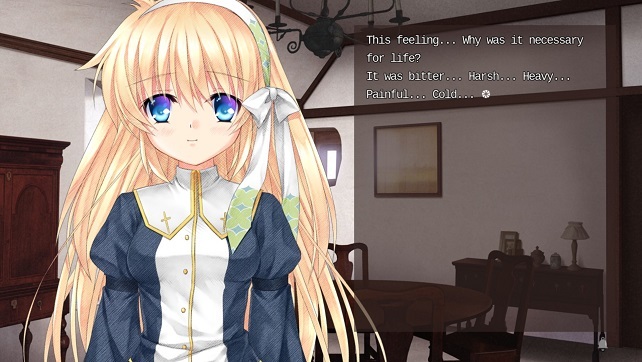 After the apparent success of the English localization of Clannad, which the company released in partnership with Sekai Project, Key has decided to take matters into its own hands in releasing the rest of their catalog overseas. Alongside localization announcements of older games, the company also announced a brand new title that would receive a translation. Unusually, the game was released in English first, with a Japanese release still forthcoming. Developed and published by Key, with translation assistance by Active Gaming Media, Harmonia was released on September 23rd, 2016 in English-speaking territories. The game is available on PC via Steam. The story of Harmonia begins with you, a nameless character, waking up in some kind of stasis pod within a ruined factory. All of the other pods in the room appear to be empty, and some are damaged or destroyed. You have no idea who you are or why you’re here, but you do manage to remember one thing…when you look down to find the skin on one of your hands missing, with mechanical parts where bones should be. As it turns out, you are a Phiroid – an incredibly human-like robot created to be a companion to humans. Phiroids are created to look as close to lifelike as possible, including an appearance indistinguishable from humans and the ability to restore energy by consuming food. 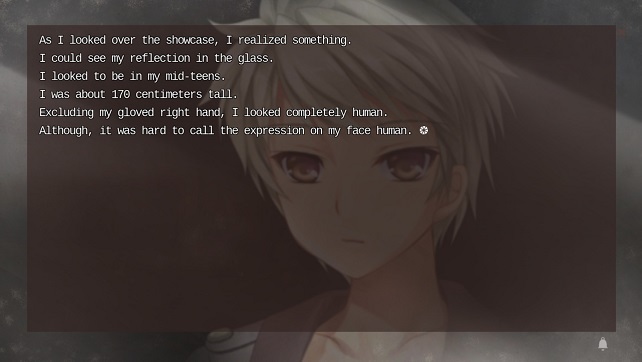 Most importantly, though, Phiroids have the ability to feel human emotions. Unfortunately for you, though, something is wrong with your body, as you are unable to feel any emotions. However, you do still have the drive to find human companions, so you set out from the ruined factory into a world that has been ravaged by war, focused on finding a group of humans you can integrate yourself into. Harmonia is a relatively short and intimate story with a focus on a small cast of characters. Aside from the main character (who receives the name Rei), only three other characters get a name and a face. The main one is Shiona, a young woman who lives in a church, is incredibly kind to a fault, and seems to have some kind of synesthesia with her interpretations of feelings as colors. We also have Tipi, a little girl who lives alone in a library and is constantly afflicted with varying levels of sadness. Rounding out the cast is Madd, a gruff shopkeeper whose personality lives up to his name. Despite the runtime of the story capping out at around five hours (depending on your reading speed), most of the characters receive a surprising amount of development. Both Shiona and Tipi have their own thoughts, feelings, and motivations apart from their interactions with Rei, lending a bit more realism to their characterization. Madd doesn’t get quite the same treatment, though, and his character ends up horribly underused by the game. Unfortunately, the strong characterization isn’t obvious at the beginning, as Harmonia suffers from some pacing problems through the first third of the game. The first three chapters, out of eight total, feel like they’re in a mad rush to introduce you to the world and the main characters. Within an hour or so of reading time, Rei meets all of the characters and somehow manages to fix major life-changing problems for them, with the story skipping over much of the detail in how he does so, opting to keep prose to a bare minimum. It’s not just the presentation that moves fast here, either – Rei manages to do all of this within a couple of in-story days. Key is known for having very long and occasionally plodding setting-establishment routes in their games. It seems like they attempted to fix it here, as they should for such a short story, but ended up going way too far in the other direction. Once you pass the third chapter, though, the pacing slows down to something more manageable and begins to put much more focus on these characters and how they live in a war-torn world. 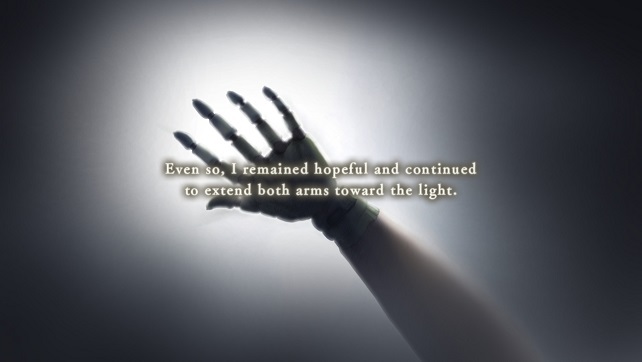 The developments and revelations throughout the rest of the story are legitimately surprising and amazing, and further reinforced by how the game really got me to care for (most) of these characters. The theme of the story is relatively obvious: emotions and how they affect relationships between people. Despite the issues I had with plot pacing, I feel that Harmonia succeeds in conveying this theme to the reader. The game isn’t all that deep, and the story within is hardly groundbreaking, but as a short story told in a video game format, the game pulls off its themes quite well. It was just last week that I was praising a game, Shin Megami Tensei IV Apocalypse, for not shying away from using color to portray a post-apocalyptic environment. As I said there, way too many games fall into the trap of using a dirty brown-and-gray color palette to create a darker atmosphere. Unfortunately, Harmonia suffers from this same issue. The background illustrations of the various environments are impressively detailed, and the way the camera pans around these environments during dialog adds to the atmosphere. However, the dull brown and occasionally washed-out palette works against this detail to make the environments feel boring. A setting like this should feel foreboding, or a bit exciting, but the one here is just dull. The character designs, though, stand in stark contrast to the tedious background. Designed by Itaru Hinoue as her last project as a member of Key, the characters are bright, colorful, detailed, expressive, and full of life. Actually, just the female characters. Shiona and Tipi both fit the above description, with attractive and well-designed character sprites. 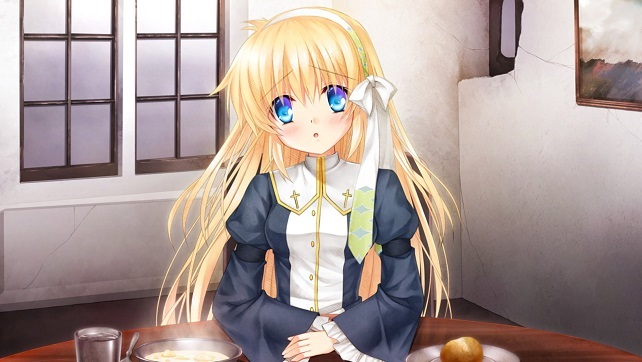 Despite some of my criticisms of Hinoue’s work, her designs for these characters are excellent. The designs shine even more in the surprising amount of CG art stills strewn throughout the story. Compared to these two, though, the designs for Rei and especially Madd come across as bland and uninspired. Rei’s design is that of every generic anime protagonist ever, and Madd’s seems like it was slapped together at the last minute. One last thing I’d like to remark on is the layout of the text over the art. 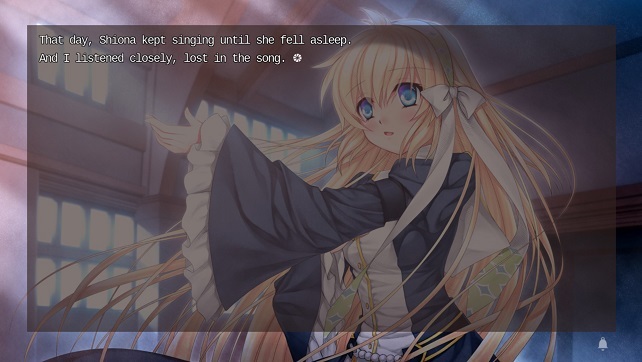 In most visual novels, dialog layout is handled in one of two ways. Either it’s relegated to a small box at the bottom of the screen, or its spread out across the entire screen over the scene art. The former allows a better view of the game’s art while limiting the amount of text on screen at one time, while the latter can just straight-up obscure the artwork. Harmonia opts for something different: setting the text off to one side of the screen and showing character sprites on the other. This format brings about a best-of-both-worlds approach; plenty of text can fit on the screen at one time while the artwork goes mostly unobscured. I became a big fan of this layout during my read through, and I hope more visual novels in the future take this approach. Ever known for its soundtracks within the community, Key didn’t slouch in its compositions for Harmonia. Composed by company mainstay Shinji Orito, along with Ryo Mizutsuki and contributions from Tomohiro Takeshita, the soundtrack of this title goes heavily down the atmospheric and ambient route. Plenty of piano and strings, along with bells and synth, create an incredibly peaceful ambiance that complements much of the story perfectly. Despite the post-apocalyptic setting, the plot’s main focus is on people’s emotions, and the soundtrack here assists greatly in invoking the ones Key wants the audience to feel. Harmonia also includes voice acting for its main cast (outside of Rei) and, despite the English-first release, is entirely in Japanese. I can’t really give a sweeping opinion on the acting, as each of the three actors and actresses turn in completely different performances. Shiona’s performance is a great fit for the character, breathing life into the dialog and contributing greatly to the emotion of later story moments. Tipi’s performance is decent for the character, but comes off as relatively one-note for most of the game. Madd’s is mostly disappointing, as its really just angry grunting and yelling…although, considering that description is basically his entire character, it could be considered fitting. Overall, Harmonia is a greatly entertaining experience with a few notable flaws. The story contained within is a great read with some amazing moments, but has some major pacing issues in the first third. Most of the characters are written well, with some great development, but the character of Madd specifically is underdeveloped, underutilized, and feels like he could be removed from the story without affecting anything. The musical composition is superb, with a number of great tracks that perfectly compliment the story and its emotional moments, and most of the character designs are extremely well done. The background artwork, though, comes across as just dull with the dirty brown filter over it. Despite my misgivings, though, Harmonia is a story worth experiencing. Some may scoff at a $10 price tag for a five-hour read, but I believe it’s a great deal compared to some of the other longer, yet full-priced options on the market. As a flagship for Key’s solo foray into the English-speaking market, Harmonia may not raise the bar, but it does mark a great entry point into the rest of their catalog. Review copy provided by Key/VisualArt’s for PC. Screenshot taken by reviewer.